It only comes around once a year – International Stuttering Awareness Day on the 22nd of October. This year it falls on Sunday , meaning we get to celebrate all long weekend! But how exactly are we celebrating? 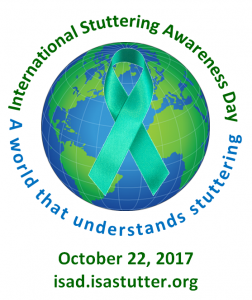 This years’ theme for International Stuttering Awareness Day is “a world that understands stuttering”, a theme we really believe in. To help further this cause, we have put together a fantastic book featuring art, poetry, and essays from many talented Kiwi kids who stutter. These kids have created some incredible pieces that discuss triumph and failure, excitement, friendship, bullying, and everything in between. They have unique experiences as kids who stutter, and because of this, each child has something different to say. We truly believe that by reading this book, you will understand stuttering on a deeper level – so the more people who read it, the faster we can reach our goal! This book also features some interesting facts about stuttering, as well as tips for talking with people who stutter. This book, titled ‘My Stutter’, will retail for $20, the profits of which will be directly used to help us support more people who stutter around the country.